mention: that the burden of costs would shift under the GOP plan from Uncle Sam to individuals. I didn’t see Granholm’s show, so I don’t know if this is an accurate summary of what she said. But it’s a good excuse to make an explicit point that might be confusing some people: Paul Ryan’s 2013 plan for Medicare is not the same as his 2012 plan for Medicare. Ryan’s 2012 plan was essentially a voucher that grew at the rate of general inflation. However, because healthcare costs are rising faster than overall inflation, this means the voucher wouldn’t keep up with the growing cost of Medicare. As a result, a couple of decades down the road seniors could end up paying huge premiums. CBO estimates that under Ryan’s 2012 plan, within a decade the government would be paying only 40% of the cost of an average Medicare premium. Seniors would be responsible for the rest. And it would get even worse a decade after that. However, Ryan’s 2013 plan is completely different. Under this plan, private providers submit bids for their Medicare policies. Their policies have to be equivalent to standard Medicare, which also submits a bid. Seniors then get a voucher equal to the second-lowest bid. Seniors still have to make the same premium payments they do today, but aside from that the voucher is guaranteed to cover 100% of the cost of at least two plans that are actuarially equivalent to standard Medicare. There’s no risk of seniors being stuck with enormous bills because the voucher is too small.1 More details here. 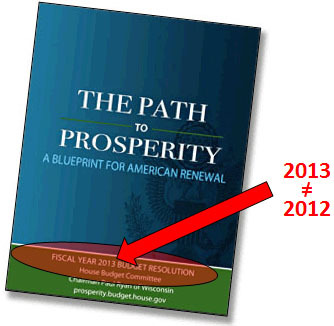 There are plenty of things to dislike about Ryan’s 2013 plan, but the truth is that it’s not that bad. I doubt very much that it would hold down costs without other mechanisms in place, since it relies primarily on competition between insurance companies, and insurance companies simply aren’t the main source of high healthcare costs in the United States. Still, if it doesn’t work it wouldn’t leave seniors high and dry. It’s a big improvement over Ryan 2012. But whatever you think of it, Ryan 2013 is the current plan, and it’s the plan that Mitt Romney supports. It’s very different from the plan that was (justifiably) savaged by the liberal community a year ago. 1Or is there? Like Obamacare, Ryan’s plan includes an overall growth cap equal to GDP + 0.5%. But what happens if Medicare costs grow faster than that even with competitive bidding? The answer is: Ryan doesn’t say. That doesn’t mean that retirees will automatically get stuck with the bill if Medicare grows faster than the cap, but it does mean that Ryan isn’t willing to guarantee that they won’t.